Fantasy buildings that was never built Archi-new - Free Dwg file Blocks Cad autocad architecture. Archi-new 3D Dwg - Free Dwg file Blocks Cad autocad architecture. When Berlin fell in May 1945 British and American interrogators were particularly keen to speak to Albert Speer, the dynamic architect who had prolonged the war against Germany through his extraordinary effectiveness as Hitler’s Minister of Armaments and War Production. He had also led the design of Germania, a monumental, although unbuilt New Berlin, composed of imperious avenues and parade-ground squares lined with improbably large civil and commercial buildings. 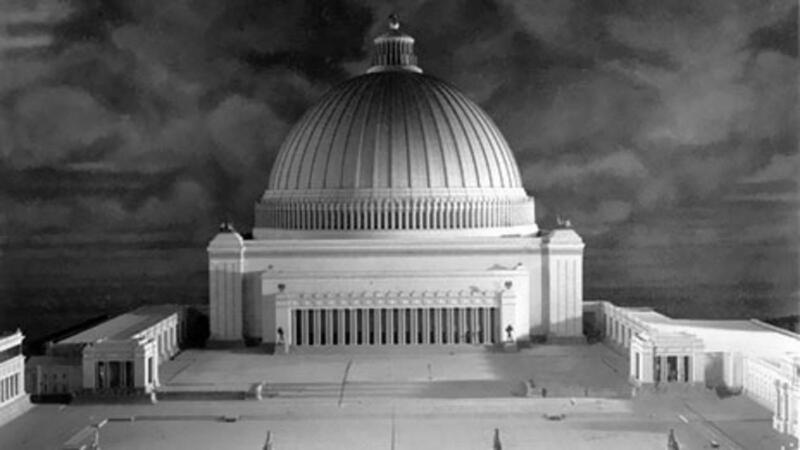 In his final days in the Führerbunker below the gardens of the Reich Chancellery, a grandiloquent neo-classical design by Speer completed in record time in late 1930s, Hitler had pored over models of Germania. The biggest of all its buildings was to be the Volkshalle – the People’s Hall – a colossal domed structure based on the Emperor Hadrian’s Pantheon in Rome. Hitler had made sketches for such a building himself as early as 1925, although his visit to Rome in May 1938 to see the Pantheon confirmed his desire to go one better than the Romans. If their empire had survived four centuries, his would last a thousand years and so needed buildings designed for an extremely long-term future. Luckily for everyone, the Third Reich missed its target by 988 years. Speer discussed the Volkshalle with British and US structural engineers in 1945, one of whom told me that the interior of the auditorium would have been so vast that when filled to capacity with 180,000 sieg-heiling Nazis, clouds would have formed beneath its coffered dome; it might even have rained on the party faithful, although presumably nothing would have dampened their enthusiasm for the rantings of their victorious leader. To give a sense of the preposterous scale of this, one of the biggest of history’s unbuilt buildings, the dome of St Peter’s, Rome, the world’s biggest church, could have been lowered through the 46-metre diameter oculus – or circular hole at the top of the dome to let in daylight – of the 290-metre high Volkshalle. Could it have been built? In all probability yes, as despite suggestions that the Volkshalle would have collapsed under its own weight, an extensive use of steel in the construction of the dome, and copper sheathing, would have enabled Speer to achieve his imperious goal. If Speer’s was among the most grandiose of unrealised architectural projects, X-Seed 4000 must surely be the tallest yet proposed by any architect. What amounted to a habitable, man-made Mount Fuji was dreamed up in 1995 by Peter Neville, an architect working for Japan’s construction giant, the Taisei Corporation. Founded in 1873, Taisei has designed, engineered and built numerous challenging bridges, tunnels and stadiums, but nothing quite like this. A demonstration of the company’s ambition and skill, this steel skyscraper formed in the guise of a hollow mountain, was to have been 4 km (2.5 miles) high, slightly taller in fact than Mount Fuji itself. The 500,000 to one million people who might have lived and worked here would have shot up and down the tower’s 800 floors in maglev trains. Taisei and Neville insisted that X-Seed 4000 would have been, if not a doddle, not so very difficult to build. Issues of security and Japan’s endemic problem with earthquakes and typhoons aside, the cost would have been prohibitive. In 2014 prices, this sensational, science-fiction style skyscraper would have cost at least $1.05 trillion. Even Albert Speer might have raised an eyebrow. At a press conference held in Chicago in October 1956, the 87-year-old architect and American legend Frank Lloyd Wright unveiled The Illinois, a mile-high skyscraper. The theatrical drawings Wright made for the occasion were on a suitably grandiose scale. Climbing up in stepped and angled stages, the 528-storey skyscraper would have been four times the height of the Empire State Building, then the world’s tallest building, and twice that of today’s record holder, Dubai’s Burj Khalifa. Because its unbuilt design dated from the mid-Fifties when the car was king in the United States, The Illinois would have provided parking for 15,000 automobiles. There would also be landing decks for 150 helicopters, while atomic powered elevators would have rocketed the high and mighty up to their steel and concrete eyries. Inevitably, perhaps, the majority of history’s most ambitious architectural projects have been nurtured by equally ambitious and competitive regimes. In a bid to outdo anything the capitalist Americans could do, in 1931 Stalin’s Communist regime held an international competition for a Palace of the Soviets. Not surprisingly, the winner, announced in 1933, was a Russian architect, Boris Iofan. His design, modified in tandem with Vladimir Shchuko and Vladimir Gelfreikh, was for a neo-classical skyscraper resembling an enormous tiered wedding cake crowned with an 80-metre-high (262 ft) statue of Lenin. There was to have been a library in Lenin’s capacious head. The entire caboodle would have risen 415 m (1,360 ft) over the Kremlin. A site was cleared for construction, meaning the gleeful demolition by the Communists of Tsar Nicholas I’s bulbous 19th Century Cathedral of Christ the Saviour. Money ran out, Hitler launched Operation Barbarossa and construction came to a standstill. After the Great Patriotic War as the Russians called their battle on World War II’s eastern front, the 11-hectare site was turned into the world’s biggest open-air swimming pool until it was replaced between 1995 and 2000 by a full-scale replica of the Tsarist cathedral. The 18th Century French architect Étienne-Louis Boullée designed a Herculean unbuilt cathedral for Paris, yet his most compelling project was for a cenotaph, or monument, to the great physicist and mathematician Sir Isaac Newton, that people would surely flock to visit today. Free of political, commercial or obvious religious concerns, Boullée’s haunting design was for a voluminous stone sphere on a great articulated base lined with cypress trees. Entered from below, the sphere was to have been perforated with holes that, in daytime, would have pierced the daunting gloom with shafts of sunlight; this light, so Boullée believed, would appear to suitably awed visitors as a glowing map of the heavens. By night, the interior would be lit by a gigantic armillary sphere – a blazing scientific instrument. There are many other designs for imposing and imaginative buildings we might like to have seen realised, from Sir Edwin Lutyens’s magnificent 1930s project for a domed Roman Catholic cathedral in Liverpool to, perhaps, Lord Foster’s currently thwarted plan for a new London airport in the Thames Estuary. To be built, however, such grand projects must coincide with particular ellisions of political and financial will. They must avoid wars, the untimely deaths of their protagonists and runs on banks too. Given how long such buildings might have taken to build, it would have been hard for any of them to have overcome so many hurdles. For better or worse, most must remain the stuff of tectonic dreams.